Haq's Musings: Forced Marriages in South Asia: Myth or Reality? There are frequent accusations of forced marriages in India and Pakistan which are regularly reported in the mass media. These reports elicit a strong emotional response from the society at large. Many such cases end up in violence with families taking the law in their own hands. A few of these cases end up in courts with the judges deciding the fate of such marriages. Let's examine the reality of "forced marriages" in South Asia. Charges of forced marriages are usually leveled mostly against interfaith or inter-caste marriages, particularly when such unions occur without the agreement of the parents on one or both sides. Accusations of forced marriages are rare for same-faith and same-caste marriages arranged by the parents on both sides, even when these marriages take place without the consent of the bride and the groom. A recent Kerala case involved a Muslim man Shafin Jahan and a Hindu woman Akhila Ashokan. The two met as fellow students studying medicine in Coimbatore, Tamil Nadu, and fell in love, according to a report in The Guardian newspaper. Akhila Ashokan, who prefers to be known as Hadiya, converted to Islam from Hinduism after meeting Shafin, and they married in December 2016. Upon hearing of the union, her "livid father went to the Kerala high court demanding that Hadiya be returned to his custody", according to The Guardian. 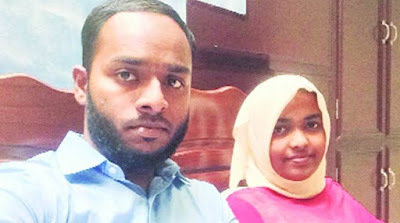 Contrary to Hadiya's express wish to stay in her marriage to Shafin, the court nullified the wedding and forcibly sent her back to her parents' home in Kottayam. When Shafin challenged it in the Indian Supreme Court, the nation's top court upheld the lower court's decision. An interfaith marriage between Pakistani Hindu woman Anoshi and a Muslim man Bilawal Ali Bhutto was challenged in Islamabad High Court by the bride's father Anand Lal. Lal's lawyer contended that Anoshi had been kidnapped by Bilawal who forcibly converted her to Islam and married her, according to the Daily Times newspaper. Anoshi told the court that she converted to Islam by choice. She took the Muslim name Maria and insisted that no one forced her to change her religion. The court directed 40-minute meeting of Anoshi with her parents and her family took place in the office of the Justice Shaukat Siddiqui where he maintained that her decisions to convert to Islam and marry Bilawal was done of her own free will. The court then allowed Anoshi to go with Bilawal and ordered police protection for the couple. Earlier in 2012, similar charges of forced marriages were dismissed when Faryal (Rinkle Kumari), Hafsa Bibi (Dr Lata) and Haleema Bibi (Asha Kumari) told Pakistan Supreme Court that they wanted to live with their husbands who they said they chose to marry of their free will. Young men and women in India and Pakistan who dare to defy traditions and go against the wishes of their parents to marry outside their faith, tribe or caste face the ire of their near and dear ones. The most common accusations leveled in such cases are those of "kidnapping" and "forced marriage". Such accusations then become fodder of the mainstream media where they are repeated ad infinitum without verification. Some of these cases end up in courts where the outcome depends on the judges own prejudices without regard to the right to freely choose marriage partners. The Indian Supreme Court's recent judgement forcing the separation of Hadiya and Shafin amply illustrates the injustice in such cases. Here's a video of Pakistani Hindu activist Kalpana Devi talking about how willing conversions of Hindu girls to Islam are often labeled as "forced conversions". She says there is media hype and distortions of facts relating to such conversions. It is important to understand the Hindu community’s patriarchal structures. It is not unusual for Hindu families to attempt to avoid social stigma by characterizing all conversions and marriages of their daughters as "forced". The judiciary’s increasing incline towards Hindu right-wing populism has worrying consequences for feminist judicial activism. A reminder of this is the Supreme Court ruling in the case of a young adult woman, Hadiya from Kerala, who was illegally confined in her natal home after her consensual marriage to an adult male, Shafin Jahan, was declared invalid by the Kerala High Court. The Supreme Court has most unexpectedly involved the National Investigation Agency to investigate whether Hadiya’s marriage of choice may actually be a symptom of a larger conspiracy by the terror outfit Islamic State to recruit youth into its ranks through the intimate weapon of mass conversion, better known as Love Jihad. This has disappointed activists who considered the judiciary as the last standing pillar upholding constitutional values and protecting women’s freedoms. Hadiya was born a Hindu with the name Akhila Ashokan. She got attracted to Islam in the course of her interactions with Muslim peers when studying for a degree in physiotherapy. She decided to convert to Islam against the will of her parents and lived independently under her new identity as Hadiya. The courts rejected two habeas corpus petitions by her father and endorsed her right to take life-altering decisions. However, this changed when Hadiya got married to Jahan. The Kerala High Court annulled her marriage and granted custody to her parents. By whipping up conspiratorial fervour, the courts, Hadiya’s parents and right-wing sociopolitical organisations have visibly nullified her fundamental right to life and freedom of association. Repeated statements made by the courts and her parents have infantilised her and rejected her ability to take her own decisions, especially those which violate the writ of her parents over her. Meant to protect women’s freedoms, the courts have not just failed to do so but unwittingly conferred a punishment on Hadiya through confinement under parental custody. She has been barred from contacting her husband and has had to give up her professional practice. Previous cases of so-called Love Jihad were premised on familiar notions of love being a state of ecstasy, naiveté and audacity. However, Hadiya’s case is not. She was not in love, she had registered herself on a Muslim matrimonial website post conversion, where she met Jahan, a young professional working in Saudi Arabia, and decided to marry him. This is what baffles many. Why would a woman in her right mind go against the grain of societal norms and take such risks? The answer may be a damning one; that women seeking mobility are increasingly realising the lovelessness of Indian families/society, rejecting these and making life choices starkly different and radical from that approved by the latter. While such transgressions have been around for as long as society has existed, globalisation is providing accelerated opportunities for the same. Thus, it may be seen that the new sites for these contestations are small towns and cities in Kerala, West Bengal, Karnataka and Uttar Pradesh where the anti-Love Jihad armies and anti-Romeo squads thrive. Love jihad bogey: Hadiya committed no crime. Why has she been in confinement for a year now? The Indian judiciary is supposed to protect a citizen's liberty. But here, it has arbitrarily taken it away, citing ‘Indian tradition’. On August 22, the Supreme Court of India struck a significant blow for women’s rights. The court scrapped the practice of instant triple talaq, which gave Muslim men arbitrary powers to end a marriage. The move bought India in line with much of the rest of the world, where most Muslim legal systems have already barred the practice. It is therefore a curious irony that the same court had also struck a blow against women’s rights just a week before the triple talaq judgement. On August 16, the Supreme Court ordered the National Investigation Agency to inquire into the religious conversion and marriage of Hadiya, a 24-year old woman from Kerala. In this, it backed an earlier judgement of the Kerala High Court. While Hadiya has converted to Islam and then married of her own choice in 2016, both courts seemed to disregard her own thoughts on the matter, preferring instead to let her father decide for her. Some media reports have presented this as a case of “love jihad”, the conspiracy theory that Muslim men woo Hindu women with the express purpose of pressuring them to convert them to Islam. This is a misrepresentation. Hadiya had converted to Islam long before her marriage. The main issue here is: does India believe an adult woman has a mind of her own? Hadiya – Akhila before her conversion – is from Kottayam in Kerala. She left home in 2011 to study for a bachelor’s degree in homeopathy in Salem, Tamil Nadu. Here she made Muslim friends and started to follow Islam. Matters soon reached a head. Akhila complained that her family forced her to perform rituals relating to her grandfather’s death in November, 2015. In January, 2016, Hadiya left her home and moved to Satya Sarani, a Muslim educational non-governmental organisation, in the Malappuram district of Kerala. Akhila’s father, Ashokan, filed a writ of habeas corpus with the Kerala High Court, asking it to locate his daughter. On January 19, Hadiya presented herself to the court. As a consequence, on January 25, the Kerala High Court dismissed Ashokan’s petition, noting that Hadiya was not under illegal detention and was staying in Satya Sarani of her own free will. Given that it had been established that Hadiya had converted of her own free will, the matter should have ended here. But in August, 2016, Ashokan filed another writ of habeas corpus in the Kerala High Court, alleging that Hadiya was likely to be taken to Syria to fight for the Islamic State. This allegation of a link with the Islamic State was backed up with little proof. Moreover, Hadiya argued in court that since she did not possess a passport, leaving the country was impossible. Yet, curiously, Ashokan’s writ was not dismissed. It is here that things start to get extremely convoluted as the Kerala High Court started to restrict Hadiya’s liberty. On August 17, the court ordered the Kerala Police to put her under surveillance. On August 22, the court tried to convince the young woman to accompany her parents to their home. When she refused, the Kerala High Court did something astonishing: it ordered her to be taken out of Satya Sarani and put into a hostel for women. A month later, on September 27, Hadiya complained in writing that for no fault of hers, she was “in the custody of the court without being permitted to interact with anyone else”. In doing so, the court invoked the colonial concept of “parens patriae” jurisdiction, under which the monarch in Britain was considered the parent and the protector of all his subjects. This concept is usually invoked when courts conclude that an individual is not in a position to defend themselves. Their National Investigation Agency (NIA) has been given judiciary clearance to investigate "love jehad"! On 14 September, Pranay Perumalla was murdered in front of his wife, Amrutha, in an alleged honour killing. BBC Telugu's Deepthi Bathini spoke to Amrutha, whose father has been arrested for plotting the attack. Amrutha and Pranay were high school sweethearts in Miriyalaguda, a small town in the southern Indian state of Telangana. They first met at high school. "We always liked each other. We used to talk a lot on the phone and then we fell in love," she says with a wan smile. Amrutha, 21, belongs to a wealthy, upper-caste family, while Pranay, who was 24, was a Dalit (formerly untouchable). In April 2016, they married despite her parents' objections. Now five months pregnant, she finds herself saying the unimaginable. "My father killed my husband because he did not belong to the same caste as me." There is no official data but according to one study, hundreds of people are killed each year in India in so-called honour killings - for falling in love or marrying against their families' wishes. Many families still prefer arranged marriages within their own caste and religion. Police have arrested Amrutha's father, Maruti Rao, and six others, including Mr Rao's brother and three alleged contract killers, in connection with the murder. District superintendent AV Ranganath told reporters that Mr Rao had allegedly conspired with his brother and two other men to kill Pranay - and those men had helped him hire the contract killers for a sum of 10 million rupees ($138,000; £104,000). He added that the attack outside the hospital was the fourth attempt on Pranay's life. Mr Ranganath also said that Mr Rao had admitted to the charges and had said he had done this because Pranay was a Dalit and his family was not wealthy. But Mr Rao and the other accused have made no independent statement about the charges. The BBC contacted Mr Rao's lawyer who said he had no comment. The BBC also visited Mr Rao's house but found it empty and no other members of the family have provided a response. On the day of the murder, Amrutha woke up late. Her back was aching, so she went to the hospital for a check-up. Pranay and her mother-in-law accompanied her. When they left the hospital, she recalls asking Pranay, who was a few steps behind her, a question. When he didn't answer, she turned around and saw him lying on the ground. CCTV footage from the hospital, which has been broadcast on national news channels, shows a man following the family as they walked out of the gate. He first hacked at Pranay's upper body with what appears to be an axe. When Pranay fell, he struck him again. Amrutha says her mother-in-law pushed the man away, while she ran inside the hospital to get help. "When I called my father to confront him, he said, 'so what should I do? Take him to a hospital?'" she says. Growing up, Amrutha says, her mother discouraged her from even making friends with children from other castes. So her parents were against her relationship with Pranay from the moment they found out about it. But that didn't stop Amrutha. "We had to run away to see each other. But I did not care about his caste or how much money his family had. What was important was that we loved each other." Even after they married, Amrutha says, her parents forced her to return home and locked her up in a room. Eventually, she managed to escape. And the couple moved in with Pranay's parents, who had accepted their marriage. Mitho is unapologetic when asked why he helps eloping women convert. He said it is his duty to provide protection to anyone who wishes to accept Islam. “We take in the eloping couples because it is our duty to provide them with security,” he said. By his own assertion, Mitho maintains regular contact with many of the women who have converted recently, supposedly to ensure their safety and security. But Hindu community leaders explain that the concept of honour killing or declaring their women as karis is foreign to the community; they insist that no convert has ever been harmed by her family following her marriage. In Kiran’s case, Hindu community leaders insist that she was abducted. “On the eve of Eid, she went to the fields with her mother to bring back fodder for their livestock. Four Muslim boys started teasing the girl as the two women were returning home. When Kiran told them off, they became angry and took her away on a motorcycle” – this is how Ramesh Jaipal, a leader of the Hindu community in Rahimyar Khan, narrated the case. He told the Herald how hundreds of Hindus peacefully protested outside the house of Kiran’s alleged abductors a day after she was taken away – only to face further abuse. Many of the protesters were badly beaten by local Muslims for gathering in a Muslim area, he says. While Kiran denies all this and insists that she left her home of her own volition, she was confused about how to explain the reasons behind her conversion. “Did you leave home because you loved Islam, or because you loved the boy?” she was asked. “I left for the love of Islam. Shabbir was simply the route to my new religion,” she replied, but could explain what it is about Islam that inspired her to convert, or how well she knew the religion prior to her conversion. Soon her answers begin to contradict each other – the question of how she landed at Mitho’s house, especially, became blurred in the thicket of her changing statements. To divert attention from her, Mitho’s men rushed in her husband. But it seemed that Ahmed was not as confident as his wife. When asked a question, his eyes darted to the back of the room towards where Mitho was standing, for reassurance and confirmation. After much confusion, Kiran whispered something in his ear and he began to talk about where he comes from. A diffident Ahmed, understandably, failed to reduce the confusion in the room. At first, he said he doesn’t love Kiran; then, minutes later, after she surreptitiously elbowed him, he began to talk about how he wrote love letters to her for two years. Neither of the two have these letters anymore. In this case, the mixing of love with religion is not as seamless as Mitho and his men would like it to appear. The court had ordered the government to take custody of the sisters, both teenagers, in late March after accusations spread on social media that they had been forced to convert to Islam. Another video showed the sisters saying they had married two Muslim men and converted to Islam of their own free will. The court said the two were adult enough to make their own decisions and that they were not forced to convert. Police say the teenagers left their home in Pakistan’s southern province of Sindh on March 20 to be married in Punjab province, where the law does not bar marriages of those younger than 18, unlike Sindh. The police detained ten people in the case and registered a formal case of kidnapping and robbery on complaints from the girls’ parents. The incident prompted a rare public intervention by a top Indian official in its neighbor’s domestic affairs, when Foreign Minister Sushma Swaraj said on Twitter she had asked India’s ambassador in Pakistan for a report. Pakistan was “totally behind the girls”, Information Minister Fawad Chaudhry said on social media in response to Swaraj’s message, but asked India to look after its own minority Muslims.